Last of the third tells the story of Shawn McMaster, growing up Shawn always loved baseball, he grew up with a baseball field in his backyard how could he not love it. 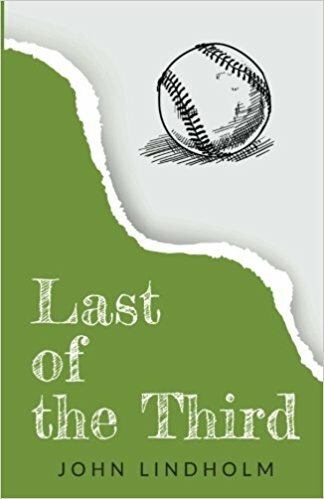 During the final exam game four years ago something happened, something that made Shawn run away from his family, his friends and his home. For four years Shawn hid away shopping in the middle of the night, working at night sleeping during the day so nobody would find him. Then one night he sees someone from his past. Can Shawn return after four years? What about the people he left behind, can they forgive him? But more than that can Shawn save his family home and the baseball field he grew up playing on? I must admit I'm not the most knowledgeable when it comes to sports however, I wanted to read this book because it caught my attention and sounded quite interesting. So I agreed to read the book in return for an honest review. At first, i found it quite confusing how the book would jump back and forth in time but once I got into the swing of it I was alright. I found myself reading on more and more really wanting to find out what Shawn had done to run away for four years, when the time came to discover what had happened I must admit I felt a little disappointed, I was hoping for something a bit more dramatic, I don't know if this is just because I'm not very knowledgeable about baseball and maybe what happened was more dramatic then I perceived but I was disappointed. Without wanting to give away any spoilers throughout the book there were many mentions about the fuse box, this got me thinking as to whether this could have something to do with where the information they needed could be, so in a sense, you were lead right into that. I found the story between Cece and Shawn heartbreaking, I felt so bad for Cece that Shawn had run away right after such in an intimate moment between the two of them and her past. I was really rooting for the two of them to make things up and get back together. Little disappointed with the ending, didn't really conclude the story of the two young lovers.